By Associated PressRepublican legislators in Wisconsin introduced a bill Thursday that would make it harder to strip public schools of race-based nicknames and would allow schools ordered to abandon such nicknames to keep them.And:Barbara Munson, an Oneida Indian who chairs the Wisconsin Indian Education Association’s Indian Mascot and Logo Task Force, called the bill racist. By Glen MobergThe proposal would make it more difficult to challenge Native American school mascots. Barbara Munson, who chairs the Wisconsin Indian Education Association's Indian Mascot and Logo Task Force, says she rarely uses the word 'racist' but that it applies to this legislation. Carol and Harvey Gunderson cofounded Religious Americans Against Indian Nicknames and Logos in their hometown of Osseo. “It's another example of the reason why Republicans have what's called a race problem,” says Harvey Gunderson.Comment: Let's review: Republicans love racist mascots so much that they're willing to pass a state law upholding them. Democrats oppose this change and were responsible for the current law, which impels school distracts to change offensive mascots. In short, Republicans are pro-racism and Democrats are anti-racism. Any questions? 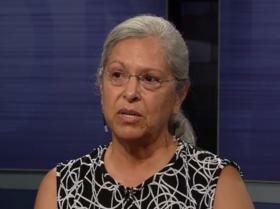 Below: "Barbara Munson, who chairs the Wisconsin Indian Education Association's Indian Mascot and Logo Task Force, says Rep. Steve Nass's new legislation is racist."